After reading this book I came to the realization that I rarely read YA nonfiction. I need to change that. This was a decent book. 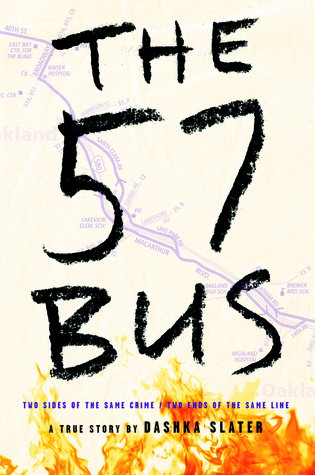 “The 57 Bus” probes the real life case of a Black male teenager who sets a White agender teen’s skirt on fire as they rode on a commercial bus on the way home from their respective schools in Oakland, California in 2013. It was a chance encounter–neither teen knew the other–but lives were changed forever. I think Slater does a great job of setting the scene, introducing us first to Sasha, the agender, Aspberger’s teen who wears skirts to express himself, and then to Richard, a Black male who grows up with a mother who works two jobs, the constant threat of arrest and incarceration. I also think the author does an exceptional job with the point of view of the perpetrator, being careful not to pathologize his behavior, but at the same time not excusing it either. This is hard to do, as most authors who write about people of color committing crimes generally tend to take one role or another. Anyway, this is a great book. Definitely a quality read.